A review in 10 words (or thereabouts): An aging masked crusader dons the mask to save a corrupt city. Sometime in the unknown future, Gotham has once again succombed to the forces of evil. 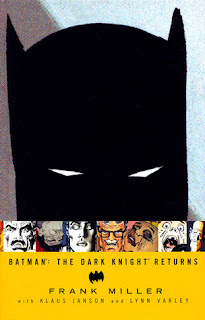 Left without a hero, Commissioner Gordon has been doing his best to keep the enemies of the night at bay, but with the release of Harvey Dent, the villain known as Two Face, and an army of miscreants known as The Mutants, he is losing the battle. In comes Batman. Bruce Wayne has been failing at retirement, so he dons the cape and mask again to put an end to the string of violence. Harvey Dent, The Mutants, The Joker, Superman...he fights just about everyone in this four part story. So far, I think I'm more of an Alan Moore girl; there's a smoothness to his writing that I found lacking in Miller's. The story kept bouncing back in forth between inner-monologue and newscasts that it was kind of difficult to follow. In fact, at some points, the entire story seemed to be told on the evening news. I didn't realize Robin was a girl. Has Robin always been a girl? And I really enjoyed Dr. Wolper, an illustrate cross between Kurt Vonnegut and Adolf Hitler. He's a pretty goofy looking man. "Don't Forget Your Reading Goals"